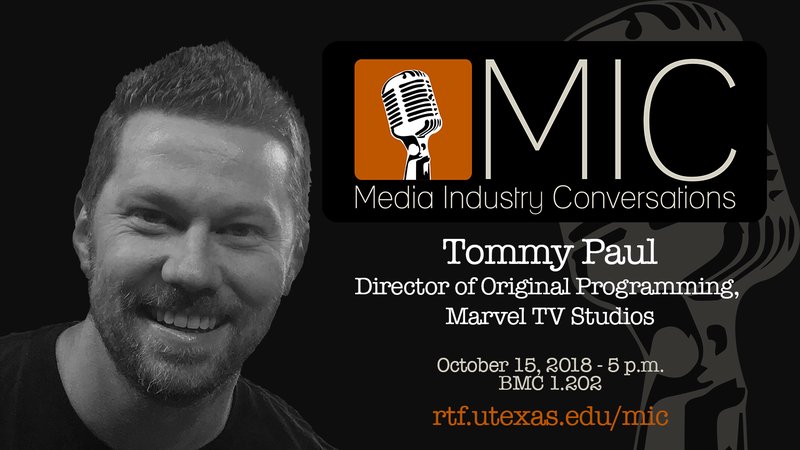 When: Monday, October 15, 2018 - 5-6:15 p.m.
Tommy Paul discussed his career trajectory, his roles and responsibilities as the Director of Original Programming with Marvel TV Studios, and his views on the current state of the media industries. Tommy Paul was raised on tex-mex and bbq in Houston, TX. After attending the University of Wisconsin, where he played varsity soccer, he moved to Los Angeles to pursue a career in the entertainment industry. Tommy got his start working on David Shore's long-running medical drama, HOUSE. Later, he transitioned into television development, and eventually joined Marvel TV where he oversaw shows such as Luke Cage, Jessica Jones, The Punisher, and Cloak & Dagger. He now lives in the suburbs with his wife, three kids, two dogs and a mini-van. He very much misses good tex-mex and bbq.